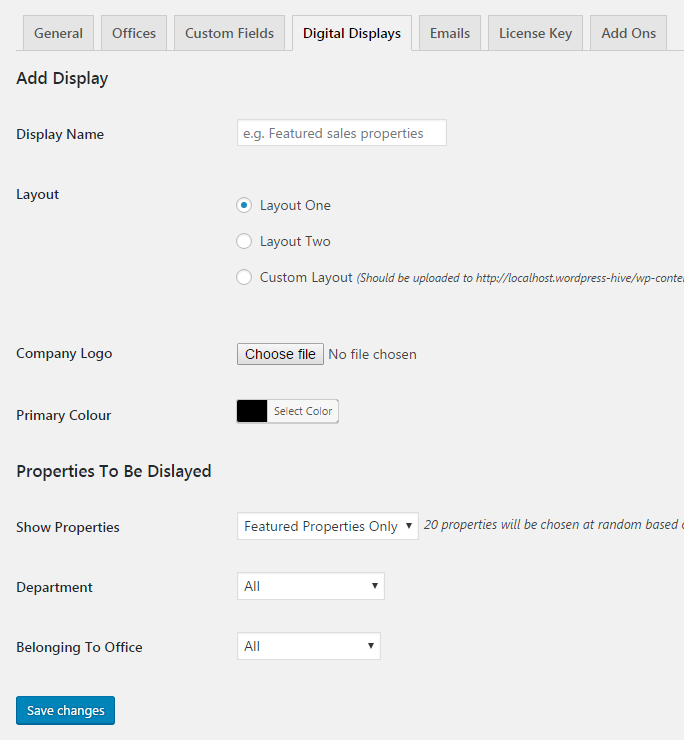 Once the Digital Window Displays add on has been installed and activated you can access the settings area in WordPress by visiting ‘Property Hive > Settings > Digital Displays‘. The main settings screen displays a list of previously setup digital displays, as well as the ability to add a new one. If existing digital displays exist they’ll be displayed in the table along with the URL to view the display and a link to edit them. From the settings page simple click the ‘Add New Display’ button and you’ll be taken to a screen where you can configure the display information. Simply enter the preferred options and click ‘Save changes’ to create the new display. It will then instantly be available for viewing. From the main settings page you’ll be presented with the URL’s to view each display. To get this onto a TV or larger display really depends on how you have this setup. Maybe you have a smart TV capable of accessing the internet, or maybe you have a TV hooked up to a separate computer. Either way, simply visit the URL provided and your display will show. If you’re using a TV hooked up to a computer, you can normally press F11 on the keyboard to switch to fullscreen mode.